While everyone loves the thrill of speed, fuel efficiency can be a dealbreaker for many buyers in a cost-conscious market like India. And hence, to keep the overall running costs of the entry-level performance bikes in check, it's important to factor in fuel efficiency beforehand. So, here’s a list of the most fuel efficient bikes in the 300-400cc segment, starting from the least efficient one. The 2013 variant of the 390 Duke came across as an exciting proposition when it was launched. Cut to 2017, and the new version is even more promising, thanks to ride by wire, improved refinement, upgraded suspension and better riding dynamics. The 390 Duke also scores big on visual appeal as it resembles its elder sibling, the 1290 Super Duke R. Powering the bike is a 373.2cc, fuel-injected, liquid-cooled, single-cylinder mill that churns out 43.5PS of power at 9000rpm and a peak torque of 37Nm at 7000rpm. A 6-speed gearbox sends power to the rear wheel via a chain drive. 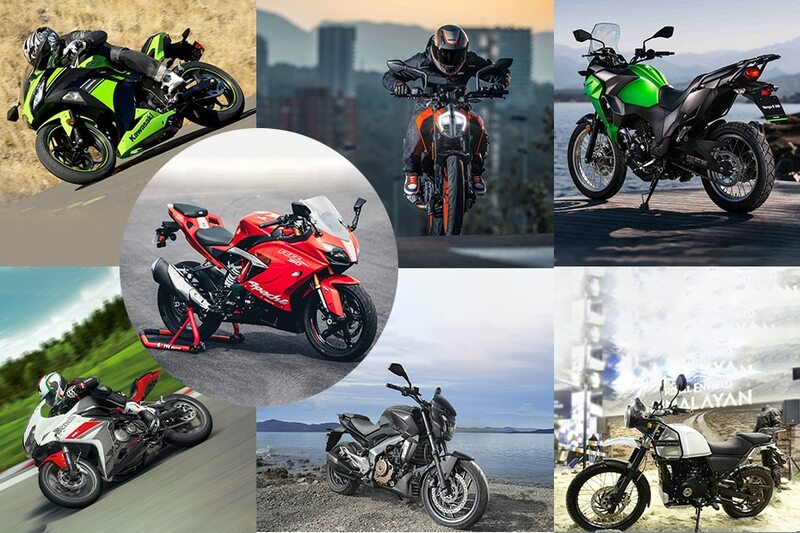 Being the most powerful bike of the lot, it’s not surprising that the 390 Duke is the least fuel efficient bike on this list. The versatility of the Versys-X 300 will appeal to novice and seasoned riders alike. It bridges the gap between the Himalayan and the more exotic adventure touring bikes in India. However, the introduction of the BMW G 301 GS might change that equation. Powering the Versys-X 300 is an ultra-smooth 296cc, parallel-twin, fuel-injected motor that generates 40PS at 11,500rpm, while 25.7Nm of torque is produced at 10,000rpm. As exhilarating as it may be, the Versys X-300 is the second least fuel efficient bike here. Much like every other Italian motorcycle, the Benelli 302R too is a looker. It may seem disproportionate from some angles, nonetheless, it does turn heads when riding around town, especially with an in-line four-like exhaust note and the big bike presence. The 302R draws power from a 300cc, fuel-injected, inline-two engine that makes 38.79PS of power at 11,500rpm with a peak torque of 26.5Nm produced at 10,000rpm. While the motorcycle looks appealing and the numbers seem strong on paper, the kerb weight of 198kg takes a huge toll on its performance and efficiency figures, putting it at the fifth spot. Bajaj introduced the Dominar in a bid to compete with the always in demand Royal Enfields in the Indian market. As per statistics, Bajaj sold 1,373 units of the Dominar as compared to the Himalayan’s 1,029 units in the month of April 2018. The feature-rich Dominar is one of the best looking sports-tourers in India available at an affordable price. Propelling the bike is a 373cc, liquid-cooled, single-cylinder motor that delivers 35PS of power at 8000rpm and a peak torque of 35Nm at 6500rpm. It comes mated to a 6-speed transmission. The engine packs plenty of grunt for city runs and the much needed weekend getaways. However, the power comes at a price, and the Dominar comes in at fourth on the list. The Kawasaki Ninja 250 was the first ever quarter-litre bike launched in India. Thanks to its parallel-twin engine, it was positioned as a premium bike. However, with growing competition in the sub-600cc segment in India, Kawasaki needed a new player to take on its rivals. Its successor, the Ninja 300 does the job well, but doesn’t quite keep up with the new breed of motorcycles available in its segment. That said, the bike still holds its own with the way it looks and with the performance it offers. Power comes from a 296cc, parallel-twin, liquid-cooled, fuel-injected engine that makes 39PS at 11,000rpm and 27Nm at 10,000rpm. In terms of mileage, the bike still manages decent figures in the real world, making its way to the third spot in our comparison. The gorgeous looking RR 310 is the perfect balance between form and function. The TVS RR 310 is exceptional in terms of its handling characteristics, ergonomics, ride quality, fit and finish and its engine heat management system. Also worth mentioning is the fact that the RR 310 is the third best-selling bike in its segment. It runs on a reverse-inclined 312.2cc, fuel-injected, liquid-cooled motor that pumps out 34PS of power at 9700rpm and a peak torque of 27.3Nm at 7700rpm. A 6-speed transmission helps transfer power to the rear wheel via a chain drive. As good looking as it is, the Apache RR 310 is also one of the most fuel efficient bikes amongst its rivals, taking the second spot on the list. The Himalayan offers an opportunity for average individuals on a budget, to experience the thrills of adventuring touring. However, it lacks on the performance front and also, it’s not the best out there when it comes to reliability. The Himalayan uses a 411cc, single-cylinder, fuel-injected, air-cooled engine that produces a maximum of 24.83PS at 6500rpm and has a torque output of 32Nm at 4250rpm, coupled with a 5-speed gearbox. The Himalayan is the most fuel efficient bike in our city and highway fuel tests. To find out the most fuel efficient bike under 250cc that we have tested, click here.